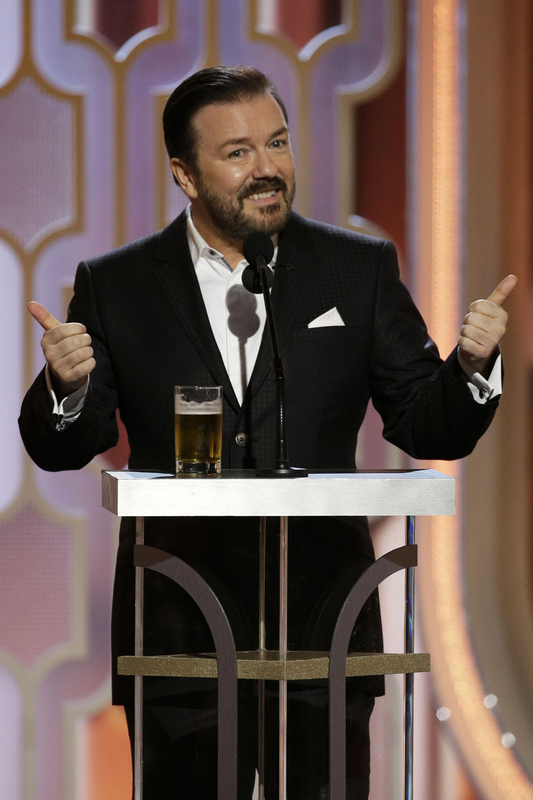 Comedian Ricky Gervais had a bit of a rocky start as host of the 2016 Golden Globes on Sunday night. His opening monologue covered awkward topics like him benefiting from the wage gap, calling Caitlyn Jenner by her former name, and many others that made us all cringe and beg for someone to cut to a presenter. Alas, Ricky Gervais made an awkward joke about Ben Affleck at the Golden Globes as he introduced The Martian star Matt Damon. "Here is the star of the hilarious comedy The Martian," Gervais said while laughing, then got serious again. "He's also the only person who Ben Affleck hasn't been unfaithful to." Damon walked out, shaking his head as he took the stage at the Beverly Hilton on Sunday night — and with good reason. Those were two low blows, Ricky! Damon and Affleck do have one of the most legendary Hollywood bromances of all time — they won an Oscar for writing Good Will Hunting together — but don't drag Damon into Affleck's divorce from wife Jennifer Garner. Let's focus on Damon's achievement in acting in The Martian, a great movie that might not be a comedy (more on that in a sec) and not his old friend's marital drama. The Martian is nominated in the Best Picture — Comedy Or Musical category to the confusion of many, including Gervais himself. He's made many jabs at the Hollywood Foreign Press for this action, which I think is deserved, but a joke is only funny so many times, my friend. How about we come up with some new jokes? 2016 is providing plenty of options already: Donald Trump is running for president, the kids like a new app called Peach, and Adele's "Hello" seems ripe for parody. Take your pick, Ricky. Watch the awkward moment below.